I’ve already mentioned that part of how we embraced our theme of Live The Way was that we stopped constantly. On our third day, we had fewer miles to cover so we just meandered from one stop to the next, and were treated with wonderful surprises all day long. 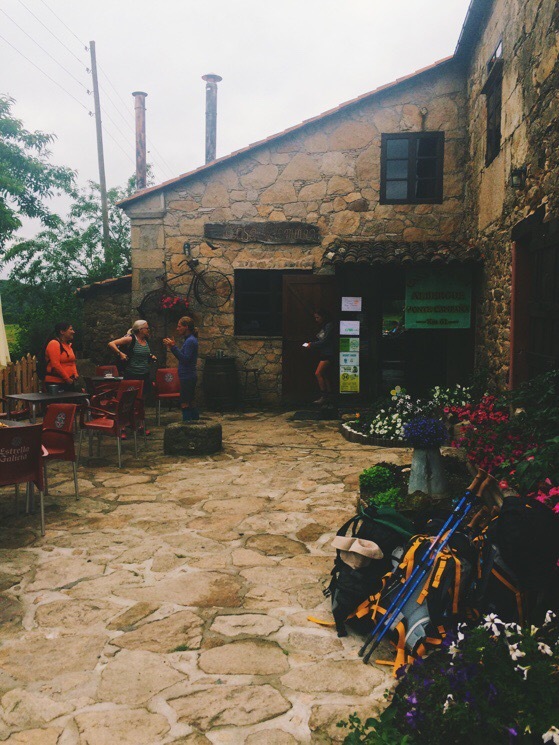 This is the story of Day 3: Walking from Palas de Rei to Melide. He rode by on a horse the first day. We were having lunch, outside in a courtyard lined with rose bushes. Drinking cold beer and eating spicy potatoes, exchanging tales and laughing. We waved and called out the greeting of the trail, still new on our tongues, Buen Camino! One man, who we would forever refer to as our conquistador, tipped his hat to us with all the grace of a courtly prince. On our third morning, as we were leaving the town of Palas de Rei, we came upon some horse barns. The horses, which had stopped at the barns the night before, were outside being groomed. LynEtte noticed them first and stopped. Diane soon joined her as the riders waved us into the barnyard to say hello to the horses. The sun was already high. We had slept later than planned after a long night of giggles and being scolded for being too loud and then giggling some more. we were stopped for horses. Oh it’s the horses! Lynette cried when she saw them. Stephanie stood outside the gate, perhaps tapping her toe just a little, while I took photos of Diane and LynEtte making friends with the horses. But soon Stephanie was talking to a mother and her daughter who had been walking for almost a month, beginning from St Jean in France, averaging over 25 kilometers a day. All pauses were like this. Someone would stop for one thing and then someone else would meet someone new or see someone you had met a couple of days before and they would start talking and then something else would happen and pretty soon we were all walking along the trail with different pilgrims, strangers until just a few days prior. After some coaxing, LynEtte and Diane said goodbye to the horses and thanked the riders for letting us come and see them. We did not share any common language with the horse riders, but the gals’ joy on their faces over the horses was evident to their owners as we said goodbye. As we continued, we all took turns visiting with the mom and daughter and they walked with us for most of the morning. Day 3 was our shortest walking day in kilometers (only 13 km) but we might actually have been out on the trail for the longest amount of time on this day. Because we stopped absolutely everywhere. The horses were just the beginning. Our next stop was Casa Domingo, a beautiful restaurant and albergue full of wonderful treasures. Like many stops, it is tastefully decorated with all the signs and symbols of the trail, both traditional and non-traditional. Old discarded boots were hanging outside and seashells in every possible size marked this stop as belonging to the Camino. We saw more of our friends from the day before, two gals from Ireland and a sweet gentleman who was walking with his mom and sister, all from Columbia. We caught up with each of them, some of them making recommendations as they set off, You must try the little round cookies! And some just sitting down with coffee. And while we sat, we met those who arrived after us, a French couple who had been completing the journey in stages over several years, only they had begun from their home just outside of Paris. They would finish this year. After setting off from Casa Domingo, we walked and talked along The Way for a while. And then we stopped again. The day was growing warm and we were drawn in by a fresh fruit stand outside of a small shop. LynEtte was already holding sweet cherries when I walked up. The lady who owned the shop was ushering us inside enthusiastically. She pointed proudly at the different offerings as my eyes adjusted to the cool, dark space. There was a basket full of fresh eggs. More fruit. Chocolate croissants and other pastries. Sitting on top of an old barrel that was standing in as a display shelf were several large wheels of cheese. She pointed at the cheese and then to a pastry, a cross between a stuffed pizza and a calzone, to indicate that the cheese was in the pastry, an empanada. Yes, we will have one of those, LynEtte said. And yes, we will have one of those as well, I said and pointed to the cheese wheels. You’re going to buy that whole wheel of cheese? Lynette asked me. Um, I’m pretty sure she said she made it here this morning. I want to try it. We selected more cherries and a couple of pins for our backpacks and took our purchases to the bar to pay. Well, yes we will have some glasses of whatever you have in that one tap there. We sat outside this little shop, breaking up cheese and pastries and exclaiming with delight over everything. Oh my goodness THIS CHEESE, Y’ALL! Simple, fresh, creamy. Can you believe how sweet these cherries are? We were advertising to everyone that came by. Telling them they had to try. Breaking off pieces of empanada and cheese. By the time we stood up to go, we had that shop about cleaned out. We would be just about to leave, but then someone else we knew would come along and we would stay to talk to them. One sweet couple from England, who we saw every day, and enjoyed so much, arrived while we were sitting and were absolutely shocked at both how much we at eaten and at how slow we were moving. They had started from a much earlier point on the trail that day and had not expected to catch up to us. You ate one of these entire cheeses!? Well, we shared some of it. It was really good! The wife told us that she had been watching for us and her husband had said that they would surely hear us before they saw us. Next a group of school children came walking up the road. They had been walking a bit of the Camino as a field trip and were clearly ready for their mini-pilgrimage to come to an end. There was a bus in the distance that must have been theirs and when they all caught sight of the bus they started running and laughing. 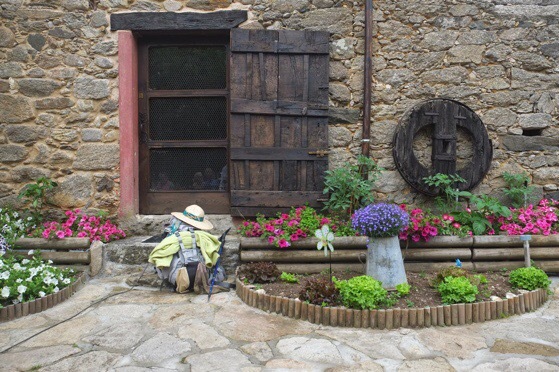 The lady who owned the shop, who had been so friendly when we had arrived, was beginning to tire as we stayed on and on, and I started to wonder if we were interfering with her siesta by staying for so long. Most of the shops close up from about 2-5pm in Galicia, and indeed in many parts of Spain. Also, we were making the day drag on so and even though we only had a little ways to go until our stop for the night, we did need to get moving eventually. But then the horses came trotting up the lane. We cheered when we saw them, and our red-scarved conquistador was at the rear. When he reached us he paused just in front of our table, then he directed his horse to prance around in a circle, spinning as we clapped and laughed. When he was facing us again, he pulled the reigns and the horse reared up on his hind legs and did a little dance, and all the while the rider was swinging his hat behind him. We applauded and squealed like children as he bowed from the waist, lifted his hat once more to us and then rode away. We sat a few more minutes, enraptured as the clip clops of his horse faded away down the trail. happened just as it as supposed to, perfectly timed. We finally left our sweet shop hostess in peace and carried on towards Melide, stopping at a medieval bridge just a little before the town, and to say a quick hello at two places where we saw friends having drinks. But by and by we reached the town, and we found a church, as in two days we had developed a custom of stopping in at a church at the end of the day to sit for a minute and to give thanks for all we had experienced, as well as get our Pilgrims’ passports stamped. But the church was locked, so we sat down on the pavement outside and prayed together. We were grateful for so many sweet minutes in the day. On the way to our hotel we found another friend having drinks and stopped again. And then the shops in Melide started to open back up which distracted us from getting to our hotel. When we finally made it to our hotel, we were so glad for a shower and a little rest before going out for dinner. We had a simple, but lovely meal. No one was very hungry because you know, we had eaten all day long. We figured we would have a quiet night, maybe not stay up quite so late. It had been such a full day of Living The Way. We had on our pajamas and were doing a bit of stretching and rubbing oils on our legs and feet, a nightly routine that Diane and I carried over from the Coast to Coast, when we heard singing. It was in the distance, but it was loud. We all went to the window and leaned out to see a group of about thirty ladies coming down the street singing. When they stopped just below us and began filing into our hotel, we decided it would not be an early night after all. We all changed out of our pajamas and went back downstairs. The ladies were all in the bar, still singing, but also taking turns ordering drinks. The somewhat frazzled bartender was walking around taking their orders and trying to close off some of the doors so that maybe the hotel guests would not be awakened by the party that had just arrived. Several of the ladies had ordered coffee, but then had him coming around with some kind of liqueur that he was pouring into all their coffees. We sat down at a table across from them and for the first couple of songs we just watched in awe as they sang in unison. Then a gal started to translate for us and explain some of the songs. She also told us that the ladies were on a bus tour from the north of Spain, and they were also going along the Camino to Santiago. But not walking. They were riding a bus and having a party all along the way. Before the night was over, we were all singing with them and exchanging stories with hand motions about the Camino. When we said goodbye, they laughed and made a motion of driving by and waving at us and laughing. That’s what they would do tomorrow if they saw us walking. Haha! We kissed cheeks all around and said goodnight. As I fell asleep each night on the Camino, I felt so full of the experiences of each day that I could not imagine that the following one could be as great. But then the next day would come and it would be full of its own wonders. As I processed the events of each day, I was always more than satisfied that we had taken Marcela’s words to heart. And I would wake up the next day with my heart all open and ready for whatever would happen next. What a great day on the Camino, Living the Way! Loves to my Princesas del Camino!